View of the parish church of St Mary’s in Harmondsworth. In the 18th century Harmondsworth was a small, rural village in Middlesex which now makes up the southern part of the borough of Hillingdon. 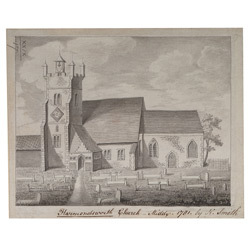 The character of the parish has changed dramatically over the past 100 years and since 1944 it has been contained in the boundaries of Heathrow airport. The church The church is architecturally interesting because unusually it was not restored in the 19th century like so many churches were. In particular has an 18th century open cupola on the tower and a rare elaborate 12th century doorway.